Cardiff Metropolitan captain Emily Allen says the standard of the Women's Welsh Premier League is improving. Met have won the league for the past two seasons and in the last campaign pipped Swansea City to the title on goal difference. They begin the defence of their title away at Pontypool-based PILCS on Sunday and Allen says the league is competitive. "The standard of the league has definitely improved," Allen said. "When we won it a few years ago we weren't really challenged at all. "But it's got more competitive, and last season was definitely the most competitive and we were challenged by three or four sides. "PILCS pushed us all the way, Swansea were up there again and Cardiff City have improved. They will all challenge us and every game will be a lot more difficult." The Women's Welsh Premier League was founded in 2008 with a north and south division, with the Welsh champions decided in a play-off final. 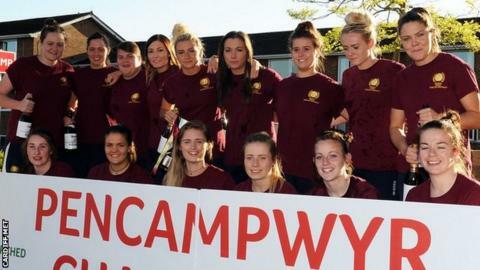 Cardiff Met, then named UWIC, were champions in 2012 before the competition changed to its current format which now features 12 teams. Allen, who has also played for Bristol Academy, says teams will be trying their best to beat Cardiff Met. "Teams are always going to want to beat the champions," Allen said. "We found, especially last season, that teams up their game when they play against us and really challenged us. "Hopefully that will continue again this season because we need that competitiveness. "But our mentality is to go out and win the league again." Cardiff Met represented Wales in the Uefa Women's Champions League during the summer but lost all three qualifying round matches in Poland. But Allen, who scored Met's only goal of the Champions League campaign, says the experience will hold them in good stead this season. "We didn't do what we set out to do in the Champions League but the teams we were playing against were of a different standard," Allen told BBC Wales Sport. "The experience will help us and we'll use that, looking to push on and be a bit more confident going into this season." As well as being a route into the Women's Champions League, Allen says the league is important for the development of young Welsh players. Laura-May Walkley and Rachel Rowe left Cardiff Met and Swansea City respectively to join Reading Ladies and are now members of the senior Wales squad. "The more the Welsh Premier League improves it can only help the national team," Allen said. "Maybe a bit more can be done to keep those girls in the Welsh leagues rather than them venturing off into the English leagues. "If they stay here then I think that could help with the progression of younger talent into the national team."